Fingal Coaches are renowned for their excellent and reliable services. You don't have to take our word for it as they recently finished in the silver medal position in the School Bus Operator of the Year category at the 2016 Bus & Coach Award. Managing Director Danny Campbell tells Irish Trucker the secrets of their success. The annual Bus & Coach Awards recognise and honour operators working within the Irish passenger transport industry. This year's event was held at Clontarf Castle Hotel, Dublin in October and Fingal Coaches received an early birthday present when taking home the silver medal in the School Bus Operator of the Year category. A family run business located at Blakes Cross on the Northside of Dublin, they’ve been providing customers across Dublin and nationwide with dependable, professional and affordable coach services since 1976 and next year will celebrate the magnificent milestone of 40 years in business. “It was our first time to enter the competition and the silver medal was a great testament to ourselves and our employees,” beamed the company's Managing Director Danny Campbell. “It was a major achievement because there is fierce competition in Dublin alone but we would be well recognised all over Ireland and well known within the industry. “Our staff must take most of the credit for the award. 95% of the secrets of our success is down to our staff, that's the trick of this business. Some of our staff members have been here the same length of time as me and some even longer. The ever burgeoning company was established in 1976 by Ken Dunne and originally located at Corballis, Donabate, Co Dublin. Five years later, they moved their base to Lusk and Danny's father James took over the reins. 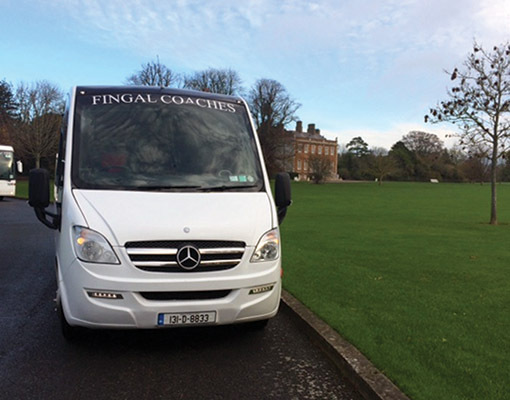 Fingal Coaches have developed into one of Dublin’s leading executive coach and mini bus hire companies. Down through the years, they’ve built up a base of returning, happy customers as a result of their affordable, on time transport service. With eight employees on the payroll, including Danny's wife Denise who he described as the 'heartbeat of the business', they currently operate a fleet of eleven pristine and well turned out buses ranging in size from a 16 seater to a 78 seater double decker. “We transport approximately 500 children to school every day on behalf of Bus Eireann and Dublin Bus,” Danny revealed. “Our fleet is always clean and presentable and we're reliable, we're always on time. Ideally based, Fingal Coaches also offers a first rate nationwide Dublin Airport Group transfer service. No matter what your location in Ireland, they can provide their Dublin Airport group transfer service to you. Driving to and from an airport in your car can be a stressful experience. Prioritising your time to ensure you make your flight, fitting your family and your luggage in to a small space and expensive airport parking are just some of the issues you may face. Let Fingal Coaches take care of your airport group transfers. With them, your airport journey will be relaxing, comfortable and considerably less stressful. Their friendly, approachable drivers will do all they can to ensure your journey is a pleasant one. They cater for small or large parties with their airport transfers. Whether you require airport transfers for your family, a hen party, sports team or work team, they’ll get you there quickly and safely. In addition, they're proud to offer their own unique Dublin City Tour service. Whether you’re a tourist visiting Ireland or a resident looking a fun activity that’s different from the norm, join them on Danny’s Infamous Dublin City Tour! Their tour incorporates various tourist spots across the Dublin such as Phoenix Park and some statuesque government buildings. They’ll also drive you out to the beautiful coastal village of Howth so that you may enjoy the stunning scenery and take in some refreshing sea air. Not content to rest on his laurels, Danny recently placed an order for a new 33 seater mini-coach from Noone's of Maynooth and his expecting delivery of the new coach in January. Fingal Coaches provide their services throughout Dublin and nationwide. Regardless of your location or coach needs, they'll be delighted to help you. Their chauffeured coaches can take the stress out of trying to arrange many different modes of transport for your event or special occasion. They offer affordable, competitive rates for all types of events. Just give them a call or request an online quote to find out more.